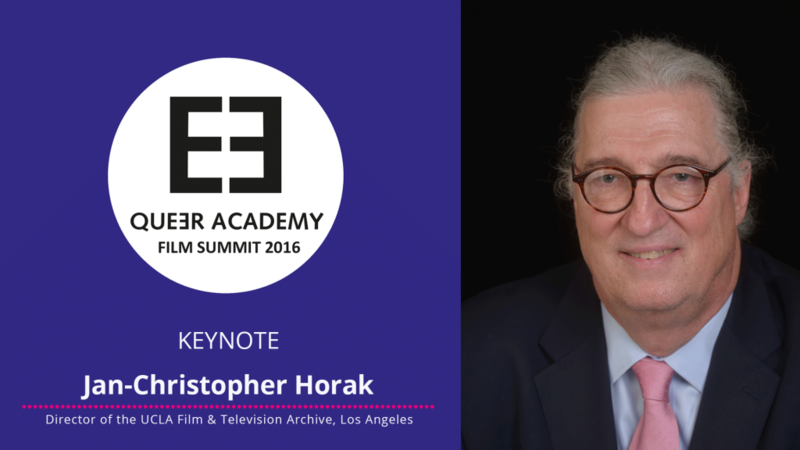 Jan-Christopher Horak, Director of the UCLA Film & Television Archive in Los Angeles, was invited as keynote speaker at the Queer Academy Summit 2016. Jan-Christopher Horak is a recognized researcher and academic based in Los Angeles, USA. He is a former director of the Munich Filmmuseum and held a professorship at the University of Münster. Since 2007, he is the Director of the “UCLA Film & Television Archive” and professor of the Critical and Media Studies at the UCLA. His publications include Anti-Nazi-Films Made by German Jewish Refugees in Hollywood (1984), Lovers of Cinema. The First American Film Avant-Garde 1919-1945 (1995), Making Images Move: Photographers and Avant-Garde Cinema (1997), Saul Bass: Anatomy of Film Design (2014). Established more than 10 years ago, “Outfest Legacy Project UCLA” is now by far the largest gay film archive in the world. Since 2005 the Legacy Collection has grown from a few thousand movies and videos to more than 35,000 titles in almost all film formats – 35mm, 16mm, 8mm, S-8mm, VHS, 2 inch video, U-Matic, Digibeta and others. The collection also includes amateur films, documentaries, avant-garde, and feature films, as well as TV and video broadcasts, for example, the entire archive of the first American TV magazine, “In the Life” (20 years), which is now accessible for everyone on the Internet. The complete archive of the LBGT TV channel, Q Television, is currently being processed and is expected to become available online. Other important items in the collection include “oral histories” by key members of the American gay movement like Jim Kepner, Lillian Faderman, Dorr Legg, Morris Kight, Troy Perry and Pat Rocco, AIDS videos, documentary photos of the first Christopher Street and Christopher Street West demonstrations in New York City and Los Angeles, as well as the historic “March on Washington for Lesbian, Gay, and Bi Equal Rights and Liberation”. In collaboration with Outfest some of the most important works, like Parting Glances (1986), The Life and Times of Harvey Milk (1984), Choosing Children (1985) and Anders als die Anderen (1919), were restored.